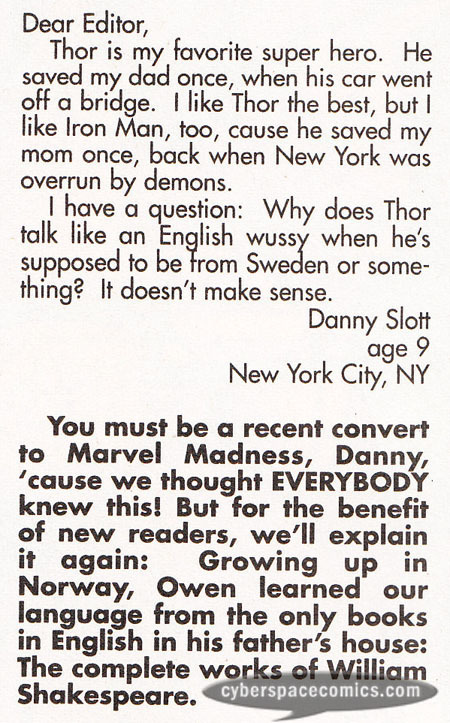 Adding to the fake authenticity, letters pages were created for the Marvels Comics one-shots that asked the question: “What would Marvel Comics be like in the Marvel Universe?” Interestingly enough, one of the letters was from a Danny Slott, purported to be age 9. Now, by this time Dan Slott hadn’t reached the heights of fame he’s since achieved but he had already been working for Marvel, for some time. So, this leads me to believe it was some kind of inside joke amongst creators/editors/assistant editors. This letter comes from Marvels Comics: Thor #1 (cover date: July 2000).